Maxine Frances Newcomb passed away at the Cambridge Manor on December 4, 2018. She was born in Swanton, NE on January 16, 1922 to William and Lois (Coe) Yost. She attended elementary school in Swanton and McCook. She graduated from Nebraska School of Agriculture in Curtis in 1939 where she was awarded a Regent’s Scholarship. Maxine taught in rural School in Frontier and Lincoln Counties. Maxine was united in marriage to Winton E. Newcomb on April 19, 1942 in the Congregational Church with Rev. Loren Messersmith officiating. 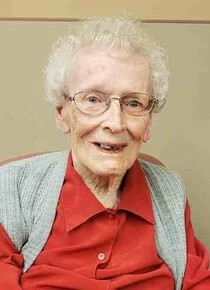 Winton preceded her in death on July 1, 2007. They were blessed with four children: Sandra Jean, Cheryl Diane, Judith Anne and Edward Allen. Maxine was an active member of the Congregational Church for over 70 years, a charter member of the Cambridge Federated Women’s Club, a member of the American Legion Auxiliary, Tri-Valley Hospital Auxiliary and several card clubs. Her favorite things besides being with family, were bird watching in her back yard, crocheting afghans, completing crossword puzzles, playing cards, jigsaw puzzles, homemade ice cream and being with friends. Maxine was preceded in death by her parents; husband, Winton; daughter, Judy: granddaughter: Amber Newcomb: sister: Jean and husband Varn Fleming; step-mother: Berdeen and husband George Thorpe: son-in-law, Robert Bassford. Maxine is survived by daughters: Sandra and husband Boyd Ready of Lincoln; Cheryl and husband Duane Kuhnel of Johnson Lake, NE: son, Edward of Cambridge, seven grandchildren: 16 great grandchildren: 14 great-great grandchildren; half-brothers: Dan Yost of Hastings, NE; Ron and wife Dee Yost of Alliance, NE; Randy Yost and wife Dora of Sterling, CO along with many family members and friends. Funeral Service will be held at the Congregational Church in Cambridge on Friday, December 7, 2018 at 2:00 PM with Bill Weaver officiating. Visitation will be held at the Lockenour Jones Mortuary on Thursday, December 6, 2018 from 10:00 AM till 7:00 Pm. Family will be present to greet friends from 5:00 PM till 7:00 PM. Friends may leave on leave condolences at lockenour.com. Memorials may be left in Maxine’s name to either the Cambridge Senior Center of the Congregational Church. Lockenour-Jones Mortuary entrusted with the arrangements.